Right in the heart of Tinos, Koursaros (which means pirate in English) will enslave you to the non-stop music played all night till sundown and keep your heart as a hostage. 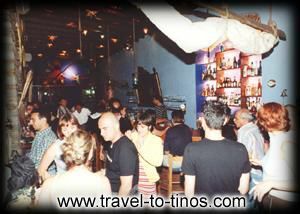 Do you really want to escape and miss the excitement, fun, new and interesting acquaintances and best music selections in Tinos. O.K! Leave your worries and inhibitions outside Koursaros' door, and get in with your heart open to musical attacks. Come to the place that knows how to rock your body and get funky. Keep on having fun until the morning sun. Join the club and drink our exquisite cocktails that are specially prepared to pass their spirit on and bring out the animal in you. Fly away with your mind. The music will guide you. Use your body in any way you can. The rhythm will get you. Never say never to anything. You may meet that special someone… Knock yourself out tonight.